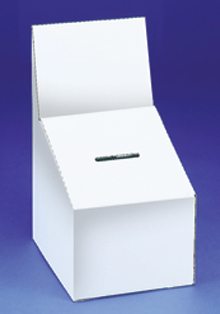 Our header boxes are perfect for contests. They will enable you to build your mailing list and determine demographics from the entries received. All boxes are made of sturdy, white corrugated cardboard. All boxes are shipped flat & are easy to assemble! These exceptionally high quality boxes are a full color printed version of our header box. They will enable you to build your mailing list and determine demographics from the entries received. All boxes are made of sturdy, pre-printed white corrugated cardboard. Pre-Printed design stands out, looks professional! Our angler boxes are perfect for contests. They will enable you to build your mailing list and determine demographics from the entries received. All boxes are made of sturdy, white corrugated cardboard. 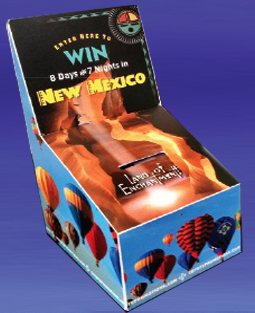 Our custom printed large boxes are perfect for contests. The pre-printed cardboard design will catch attention from even across the room. They will enable you to build your mailing list and determine demographics from the entries received. All boxes are made of sturdy, white corrugated cardboard. 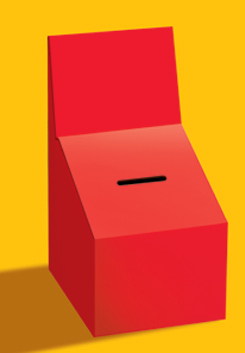 Our "red-box" is available in 3 different colors and is certain to attract attention to your booth! 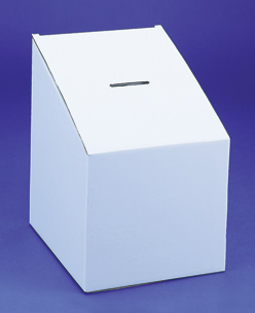 All boxes are made of sturdy, pre-printed white corrugated cardboard. Bold colors attract attention attention! 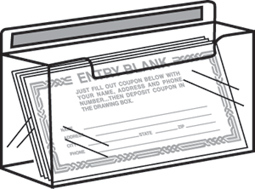 An alternative to leaving your entry forms laying on the table, our pre-taped acrylic entry form holder can be stuck anywhere to keep your entry forms visible! 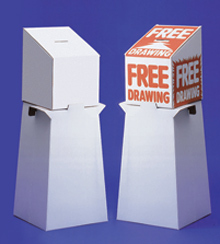 Free standing contest boxes let you keep your counters clear! 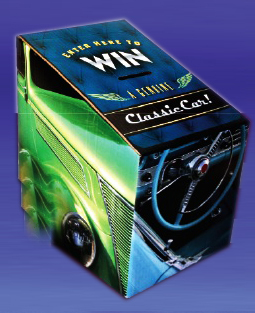 Copyright �2009 AmericanContestBoxes.com. All rights reserved.